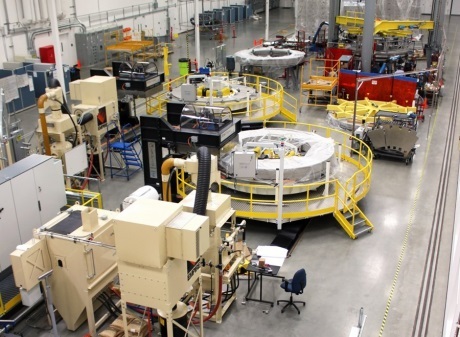 Fabrication of the central solenoid of the Iter fusion project has been started by the USA's General Atomics (GA). The solenoid - due for delivery in 2019 - will be one of the largest superconducting electromagnets ever built. The central solenoid - measuring 18 metres in height, over 4 metres in diameter and weighing some 1000 tonnes - is designed to initiate and drive a hot plasma for fusion energy. In a 10 April statement, GA said it had started fabrication of the magnet modules at its Magnet Technologies Center in Poway, California. The fabrication hall is equipped with ten manufacturing stations, precision machinery, a 200-tonne capacity air-driven transport cart, a two-storey 600ºC convection oven, and a two-storey insulating machine to apply 200 kilometres of fibreglass tape. GA will fabricate seven modules - six composing the central solenoid plus a spare one. Some 6.4 kilometres of superconducting niobium-tin conductor will be wound into coiled layers for each of the magnet modules. The company expects to complete winding of the conductor for the central solenoid modules in 2017. The modules and the solenoid's supporting structure will be delivered to the ITER construction site in Cadarache, France, in 2019. It will then be assembled on site. GA noted, "Fabrication will require unprecedented engineering and scientific advancements to assemble the technology into a new clean energy source." US Iter project manager Ned Sauthoff said, "The central solenoid represents the heartbeat of Iter, because it pulses the magnets that drive electric current through the Tokamak plasma." Director general of the Iter Organization Bernard Bigot said, "Nothing gives us more confidence, here at the Iter Central Team, than witnessing the progress in the manufacturing of Tokamak components." He added, "The central solenoid is a strong symbol of what the Iter international collaboration is about ... Japan has provided the conductors; the USA will be transforming the conductors into the finished coil; the coil will then be shipped to the Iter site and assembled into the machine." The Iter project is meant to take nuclear fusion research to a new level with the largest ever Tokamak unit, which should be capable of sustaining plasmas that produce 500 MWt for as long as seven minutes. The EU is funding half of the cost while the remainder comes in equal parts from six other partners: China, Japan, India, Russia, South Korea and the USA. The facility is expected to reach full operation in 2027.